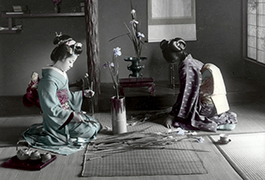 The William E. Muse Lantern Slide collection includes 1,458 glass lantern slides featuring early twentieth century scenes of Africa, Asia, and Europe. 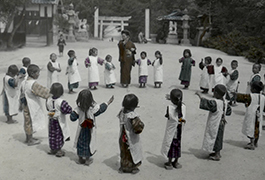 The slides were created or collected by William E. Muse to illustrate lectures on different regions and cultures he had encountered while traveling around the world. Items of special note include images of Japan, shown here, including the American Baptist Missionary Union ship Fukuin Maru. The collection also includes 173 slides of the Italian army campaign in the Alps during the First World War. 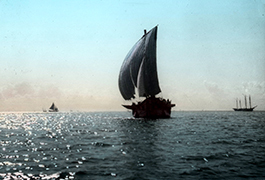 Altogether the collection presents a rare look at the world encountered by an early twentieth century adventurer. William Edgeworth Muse (1865–1942) was born in South Carolina, reared in Texas, and attended Texas A&M University. In December 1885 he married Adine Martin (1866–1935) of Brownwood, Texas. The couple moved to Chicago, where William worked for the John V. Farwell Company, one of the Midwest’s largest wholesale dry goods concerns. After making his fortune, Muse retired from business around 1910 and settled in Glen Rose, Texas. 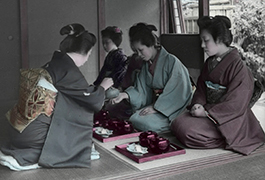 In retirement Muse served as a judge, traveled internationally, and used lantern slides to illustrate lectures about the many different places and cultures that he had visited. In 1929 the Muses deeded their 1500 acre Glen Rose estate to the Texas Scottish Rite Hospital for Crippled Children. In their final years, they lived in Dallas. As early as 1920 Judge Muse announced that he intended to donate his large lantern slide collection to an educational institution in Texas. In 1938 he lent the collection to Southern Methodist University (SMU). Shortly after Muse’s death in 1942, his sister, Ethel Muse Gillespie, donated the collection to SMU. 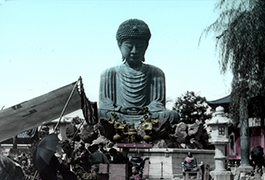 The William E. Muse Lantern Slides of Japan were digitized in 2013 with the financial support of Perkins School of Theology through the Lewis Howard Grimes Curriculum Endowment fund. 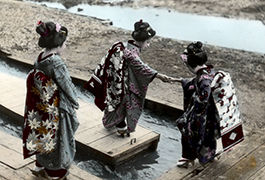 A finding aid to the William E. Muse Lantern Slides is available at Texas Archival Resources Online. For more information about the collection, please contact Bridwell Library Special Collections.